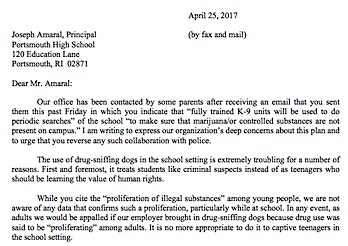 The use of drug-sniffing dogs in the school setting is extremely troubling for a number of reasons. First and foremost, it treats students like criminal suspects instead of as teenagers who should be learning the value of human rights. 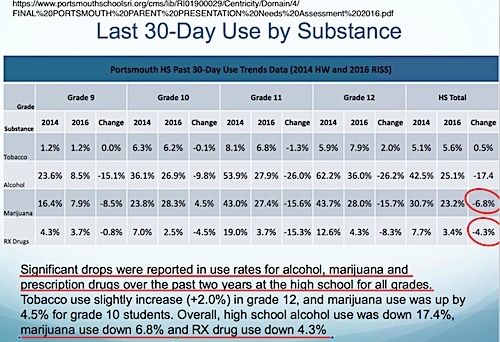 While you cite the “proliferation of illegal substances” among young people, we are not aware of any data that confirms such a proliferation, particularly while at school. In any event, as adults we would be appalled if our employer brought in drug-sniffing dogs because drug use was said to be “proliferating” among adults. It is no more appropriate to do it to captive teenagers in the school setting. As you are undoubtedly aware, one day just last month, K-9 searches were conducted at Middletown High School as part of a “training exercise.” As is almost always the case with these these types of “exercises,” no drugs were found in the school. Since your plan does not appear to be prompted by any actual reports of widespread illicit drug activity at the school either, it remains abundantly clear that these searches are not really about rooting out drug problems; they are just blatant displays of raw police power and intimidation. 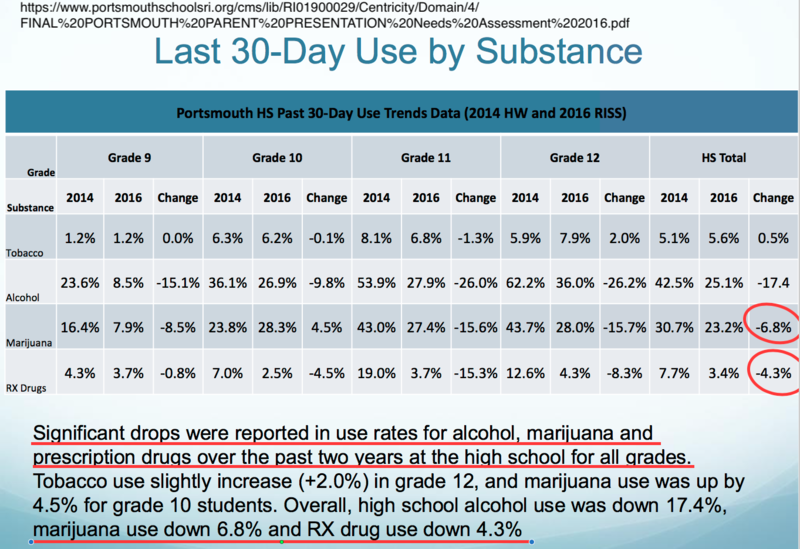 One of the documents I submitted in my complaint filed with the ACLU was the most recent "Portsmouth Youth Substance Abuse Needs Assessment," posted on the school district's own web site, which shows a decline in drug use. Here's the relevant page (annotations are mine; click to embiggen). I'm encouraged to know that I'm not the only parent who reported this to the ACLU, but I'm not surprised. At a meeting of the PHS Parent Advisory Board on Monday evening, 2 out of the 3 parents attending expressed their opposition to the plan. (Yes, I was one of them.) At that meeting, Principal Amaral disclosed that the plan was to have the dogs sniff not only lockers, but backpacks as well, which I find particularly problematic.